Acrylic / Plastic. 410ml break resistant acrylic / plastic. 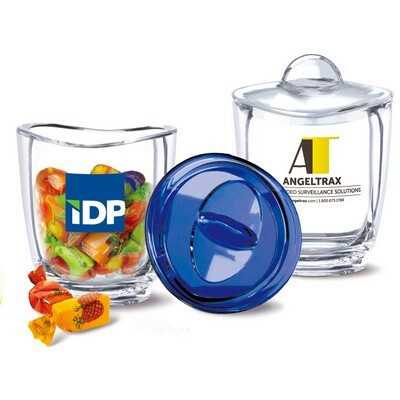 Transparent coloured lids available. A museum piece with elegant arcs, dramatic dips and fluid form combine to create a functional yet fun presentation. CLEAR/CLEAR, Transparent Sapphire Blue/Clear. Product Size: 133H w/lid x 101W mm. Print. Size: 44Hx69W mm per side. Price includes : Print Up to 1 colour. Setup is additional. Please contact your sales representative for a final quote.